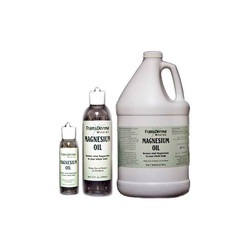 Magnesium Oil (12 oz.) Magnesium Oil is an extreme concentrate of the form of magnesium that is the keystone of cellular regeneration. We call it the "Fountain of Youth in a Bottle"
Magnesium Oil is an extreme concentrate of the form of magnesium that is the keystone of cellular regeneration. We call it the "Fountain of Youth in a Bottle". It activates your Parasympathetic System and allows you to relax, rest and repair. An excellent means of absorbing critically needed magnesium and essential moisture for cellular regeneration. This liquid solution of magnesium chloride in energized and structured Living Water gives immediate delivery and absorption into living cells. Magnesium is critical for your cellular health, your nervous system, regenerating & maintaining living tissue, a nutrient essential for virtually every reaction in the body. Due to large-scale factory farming methods used today, most people don’t get the daily requirement of magnesium in their diets from eating fruits and vegetables. Without the essential mineral, the body can become out of balance and present in a number of different ways. High blood pressure (hypertension), muscle cramps, diabetes, tingling and restless leg syndrome are just some of the symptoms that can result from a magnesium deficiency. Simply rubbing the magnesium oil in the needed area will restore balance and alleviate symptoms. Relax Stiff Joints and Alleviate Pain. Stop Cramps. Prevent Injuries. Restore vital magnesium to enable cellular regeneration. Powerful shift from stress (fight or flight) to relaxation (rest, repair, digest). Magnesium oil can help alleviate joint pain & stiffness. Excellent treatment for resistant skin rashes. Soften and smoothe wrinkled skin, fade age spots and nourish weathered skin. Used as a massage oil in physiotherapy and chiropractic applications. Wonderful food flavor enhancer and a magical dental spray. Excellent deodorant, and also prevents cramps and spasms. Spray on any area of concern as often as desired, to enhance your vitality and reverse the effects of aging, by stimulating regeneration. A saturated solution of minerals derived from pure sea water, Magnesium Oil is a crystal clear, odor-free concentrate of magnesium chloride that has been energized and restructured. Add about 2 oz Magnesium Oil to your daily bath and soak for at least 20 minutes. Let dry and do not rinse it off. After bathing or showering, apply to your skin anywhere), then let dry. If you feel the need, you may rinse it off in the shower or bath. Your body will absorb the magnesium it needs. As a daily foot soak, in a small basin, add enough Magnesium Oil (or dilute 50/50 with Prill Water) to cover the tops of your toes. Soak for 20-30 minutes. When used full strength, the Magnesium Oil may be reused as long as it stays clean. If desired, rinse feet after soaking and towel dry. As a body spray, mix a solution of 50% Magnesium Oil with 50% Prill Water. Spray your entire body and air dry for best results. There is no need for additional washing or rinsing, however, once dried, the natural salts in the Magnesium Oil may be uncomfortable, and rinsing is fine. Magnesium Oil may be applied full strength. It you experience stinging (it will happen when you apply it to cut, scraped, broken, or damaged skin) use 50/50 dilution with Prill water. Apply the Magnesium Oil to areas of concern several times a day and massage gently. For healing and maintaining oral health, apply to your tooth brush, teeth, gums and under your tongue. Even discoloration of teeth can fade. It is effective with abscesses. Feel free to personalize your Magnesium Oil by adding essential oils, or layering with Coconut Oil for an exotic experience! If using essential oils, remember to shake the blend every time you use it, as the essential oils will separate from the Magnesium products. If irritation occurs when applied on your skin, dilute 50% with Prill Water. Magnesium Oil can be taken internally. As a salt substitute it can be sprayed onto foods. A little amount mixed in fruit juice takes away the sour taste. Try a Spray Bottle for spraying anywhere anytime..